A famous saying is , “Nothing clears a troubled mind better than shooting a bow.” We couldn’t agree more, and while a session at the range does clear out the cobwebs, sometimes a change of pace different than draw, release, repeat… is good for us. 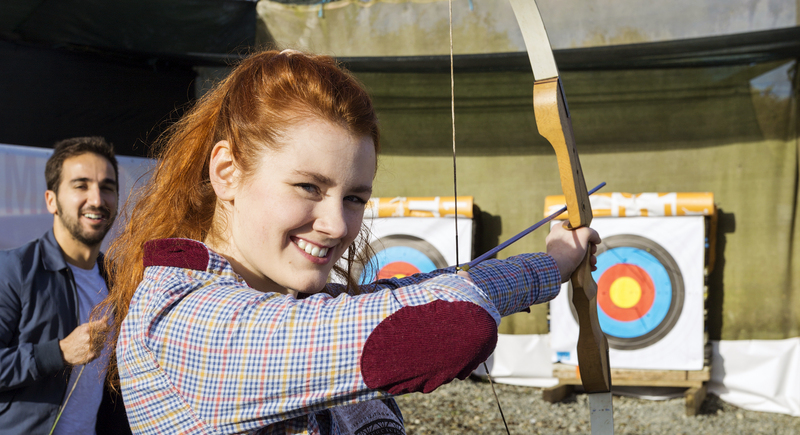 Here are some ways to make your archery practice more social, fun and maybe even more effective. To shoot an arrow, an archer first assumes the correct stance. The body should be at or nearly perpendicular to the target and the shooting line, with the feet placed shoulder-width apart. As an archer progresses from beginner to a more advanced level other stances such as the “open stance” or the “closed stance” may be used, although many choose to stick with a “neutral stance”. Each archer has a particular preference, but mostly this term indicates that the leg furthest from the shooting line is a half to a whole foot-length from the other foot, on the ground. Those are just the basics, come visit us and we will make you an expert!